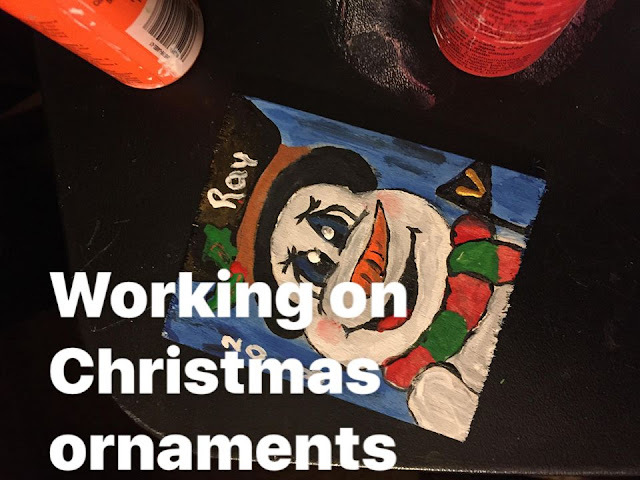 But last night I decided I needed to do something and since I still have ornaments to make for the family I decided to work on them. Made my great nephews also. Yesterday I also got a wild hair and decided to bake. And orange flavored choc chip cookies. The cookies were a flop as far as I am concerned. Too cakey and not cookie like. Can't really get the orange taste either. Sandee over at https://comedy-plus.com/ had this question thingy on her blog. I love doing these things. My answers are in bold. 1 – My furbabes____ brings out the best in me. 2 – Uncontrollable pain_____makes me grumpier than Grumpy Cat. 3 – If money grew on trees, I would ______grow a backyard full___. 4 – I have a fear of ___SPIDERS. to the inside of your home? want to enjoy in my house. 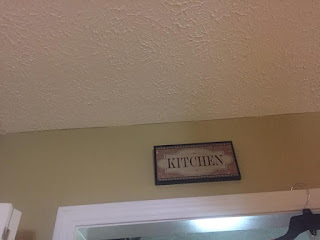 Also many years ago when I redid the kitche I took an idea from Cracker Barrel~ a shelve above the pantry door. Hung upside down also since the wooded brackets would not fit over the door opening. Found this cute little surprise above a door on PINTEREST. and that did not get done. 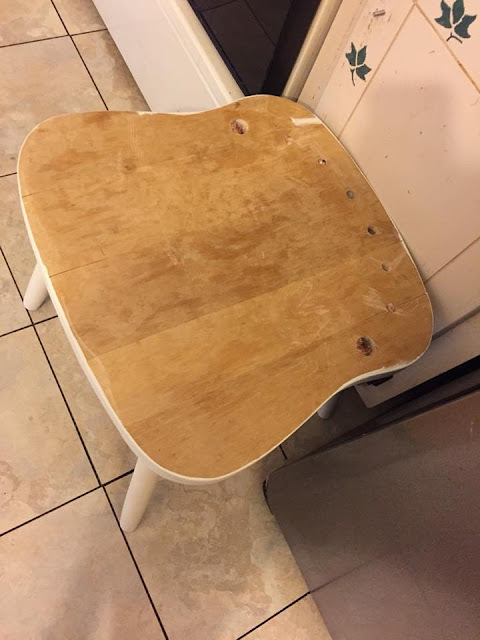 But the chair stayed in the kitchen because Lily used that as her stool to eat her meal on. About a month ago I removed the backing of the chair and I had decided that it would be fixed up for Lily. It was a dirty white color so I painted it a cream color. I decided that I would get some contact paper and cover the top. It would be great for feeding, I could wash it down. HAHA...but apparently contact paper is not used that often anymore. My run (first time out of the house in days...days...) to Wally World proofed that their section of contact paper, if that is what you want to call it, was horrible. Shout out to Billie Jo at afternooncoffeeandeveningtea.blogspot.com/ for the sweet gift I won over at her blog. Smells great. 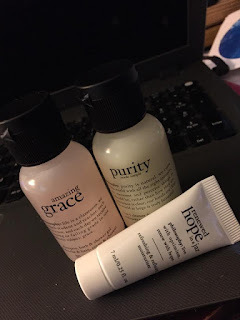 I have not used any yet but I will be soon. Took my car to my brothers house a week ago Tuesday. Having issues with the window not wanting to go up. Thought it would be a fast fix but the bolt that holds whatever that operates the window must have fallen all the way out so my brother is seeing if he can order one so that he can get me fixed up. Luck has it that Mark has several autos so I am driving one of his older BMWs...and I feel so out of place in it!! My heart goes out to my oldest brother and sis in law. Their Chocolate Lab Moose had to be put down on Tuesday. He had a big tumor and was in a lot of pain. I know that making that decision was not easy, it never is but Moose is no longer in pain. 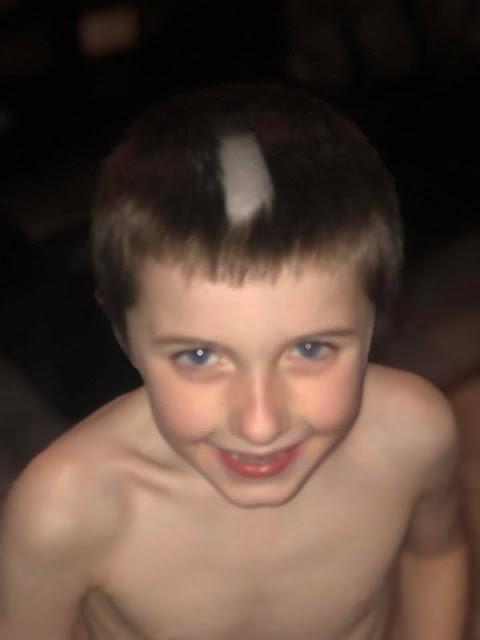 This evening my youngest grandson Braden decided to take my oldest grandsons beard clippers to his head. Thank goodness that my daughter had some hair clippers so that she could clean this mess up.. I had forgotten that about 2 weeks ago I took some pics of the birds visiting the Crepe Myrtle in front of the deck. Mrs. Cardnial. But then I got stuck on the hummingbird.